Sam Cooke was an American singer-songwriter and entrepreneur. Widely regarded as one of the greatest and most influential soul singers in history, he invented soul music and inspired thousands of singers and musicians over the years. His powerful yet smooth vocals had an incredibly effortless delivery that could never be surpassed. Born “Samuel Cook” in Clarksdale, Mississippi in 1931, his father was a Baptist minister. His family relocated to Chicago in 1933. He attended Doolittle Elementary School and later moved on to Wendell Phillips Academy High School. Cooke and his siblings developed an early interest in music, both as listeners and performers. 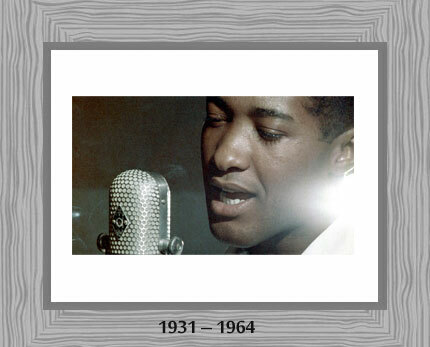 Sam Cooke became the lead singer of the gospel group, Highway QC’s, at the tender age of 14. He joined the Soul Stirrers in 1950 and recorded various gospel songs. Cooke is credited with bringing gospel music to the attention of a younger crowd of listeners. His charming looks made him a sensation and brought him a massive audience of fans, comprising of mostly young girls. Cooke later experimented with rock ‘n’ roll, soul, and rhythm and blues genres and eventually became one of the earliest soul performers to reach out to a mainstream audience. He is also credited with pushing the boundaries of race in popular music. Cooke broke through to the pop charts after releasing a series of chart-topping singles such as “Lovable”, “Chain Gang”, “Sad Mood”, “Cupid”, “Bring it on Home to Me”, “Another Saturday Night” and “Twistin’ the Night Away”. A prolific songwriter, he also made several appearances on television. Cooke was fatally shot dead in 1964 by Bertha Franklin, the manager of a Los Angeles motel, at the peak of his career. Only 33 years old at the time of his death, his funeral was attended by thousands of fans from all over the country. His body was buried at Forest Lawn Memorial Park in Glendale, California. In recognition of his extraordinary contributions to music and art, Sam Cooke has been inducted into multiple halls of fame, including the Rock and Roll Hall of Fame in 1986, the Songwriters Hall of Fame in 1987, and the Rhythm & Blues Music Hall of Fame in 2013. He was honored with the Grammy Lifetime Achievement Award in 1999. Sam Cooke was married twice. In 1953, he married his girlfriend and singer-dancer Dolores Mohawk. The marriage ended in a divorce in 1957. Cooke married his high school sweetheart, Barbara Campbell, in 1959 and they had three children: Linda, Tracy and Vincent.